A FICTIONWISE DARK FANTASY BEST SELLER! "...a compelling drama..." - Eternal Night Magazine, U.K.
"5 Stars! - DEAD WALKERS: THE PROTECTORATE is a terrific fantasy that provides the audience a powerful tale in which the three prime species, vampires, mortals, and the quasi seem genuine especially in their varying interrelationships. The action-packed story line provides insight into the diverse vampiric clans and how the quasi live in human and vampiric camps. The triangle of life and death between the lead trio makes for a compelling one sitting supernatural thriller, but it's the world they live in that fascinates readers. 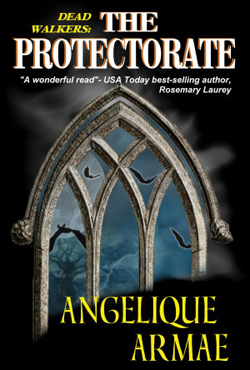 Hard as it is to believe Angelique Armae gets better with each book she writes. Everyone should put her on their must read list! -- Harriet Klausner, Amazon.com #1 reviewer & Midwest Book Review. "4.5 STARS! - Ms. Armae has created an intriguing vampire world with the Dead Walkers series. Two rival factions of vampires tempered by a powerful line of royal Celts provides for plenty of conflict and action, and not a little romance. As secrets are revealed, readers will be stunned at what happens as a result. THE PROTECTORATE takes place in the Regency era, so it fascinating to see how the restrictions of society in those days affects all that the vampires do. Most vampire romance novels take place in modern times so it was a refreshing change to see this story introduced in a different era. Donovan is a tortured hero who feels keenly his perceived failure that ultimately resulted in death for those closest to him. Iceni is strong and willful, determined to fulfill the destiny her family has set forth for her. She never expected that the one being who could help her would be the one who could change her life irrevocably. Vastos is cruel and evil, yet readers will still feel some sympathy of him over his desperate attempts to try to experience life more fully. His methods may be frowned upon, but one will come to understand him nonetheless.